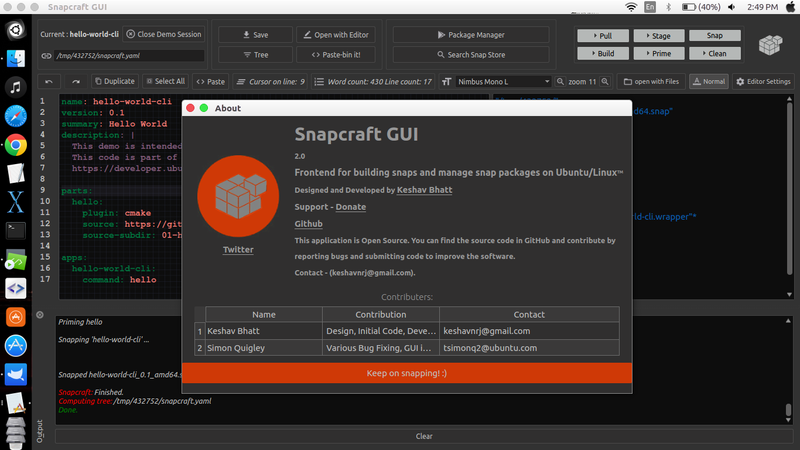 Snapcraft GUI is Graphical user interface to create and manage snaps packages using Snapcraft and Snapd respectively as the backend, software is written in C++/Qt by Keshav Bhatt. An example snapcraft.yaml built in snapcraft-gui just to build a snap and test all features and commands. Check for updates on startup, to ensure the user is running the latest version of the tool. Add an icon to gui. Editor now have settings which are saved and loaded in next session. If you are having trouble or would like to help out, join ##snapcraft-gui on freenode.